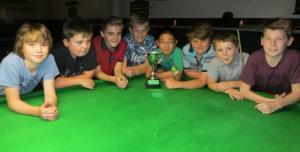 A WEEK away from the start of the new Cuestars season, preparations are also being made for the third running of the Autumn Half-Term Cup at Chandler’s Ford Snooker Club. Since May, 2013, World Snooker coach Tim Dunkley has run skills training and competitions for under-18s on every weekday of every school holiday. There are six different events each year: February Half-Term Cup, Easter Cup, Ken Jones May Half-Term Cup, Rotary Summer Cup, Autumn Half-Term Cup and Christmas Cup. The total numbers of days played so far is 151. The next one runs from 11am-3pm, Monday to Friday, October 26-30. Cost is £6 a day. You don’t have to play every day, you do not need to be a club member, there is no dress code and no pre-booking is required. Just turn up by 11am on any day. Complete beginners are catered for. All activities are handicapped. In the morning, we usually do the Cuestars Coaching Programme or billiards or cricket (another game played on a snooker table). Every afternoon, it’s snooker. Fridays are usually snooker all day. Small prizes are awarded for the daily winners. The rankings leader (and usually second and third) receives a trophy at the end of the week. But more importantly, the lads and lasses are honing their skills. It is noticeable how the standard increases over the week. Picture by Tim Dunkley. The line-up for the final day of the 2015 Rotary Summer Cup.